Sometimes writing feels like magic. Most of us have experienced it at one time or another. Some people call it “being in the zone.” Other people label it “muse.” Whatever name it goes by, there are moments when the writing flows from our fingers with ease and fluidity. Moments when it seems as if the words were already there on the screen before we even had a chance to think them. Moments when we read what we’ve written and say to ourselves, “That’s good. Where did it come from?” If you’re lucky enough to have experienced one of these magic moments, then, chances are, you’ve spent a LOT of time since trying to recreate it. (If you’ve been successful, please send me an email with your magic recipe.) While I’m still not able to conjure such carefree creativity at my whim, I’ve learned a few tricks to help me get there, and one of them is music. Writers have different opinions about what makes good background noise for putting words on paper. Some prefer lively coffee shop conversation while others need absolute silence. And when it comes to music listeners, I’ve heard of everything from classical to thrash rock. I used to make specific playlists for my larger projects. My middle grade novel about a geeky gamer included “Pinball Wizard” by The Who and “Hero” by Family of the Year on its playlist, while my comedy-fantasy novel set in Hell had more Band of Heathens and Hank Williams. (It made sense, trust me.) While themed soundtracks are fun and sometimes do inspire me, they’re also prone to steal my attention away from the task at hand. A slow song switches to a fast one or something easy to sing to comes on and before I know it I’m Googling lyrics or checking Facebook while humming along. Plus, creating those playlists is a really fun method of procrastination. Eventually, I figured out what I need is music that fits any genre—something that inspires me without distracting me. And I found it: yoga music. I used to take kundalini yoga classes, and I loved the musical mantras that played while I breathed and meditated. Unfortunately, I rarely make it to yoga anymore, but I can still tune into the kundalini mindset by listening to the music at home, and that mindset works well for writing too. While the songs are different, they all have a similar cadence and tone so that transitions aren’t jarring, and the beat is both energetic and soothing. These days, when I find myself fidgeting in my desk chair and wanting to run away from my work-in-progress, I turn on my yoga playlist, take a deep cleansing breath, and get one step closer to that magical writing moment that I seek. And, as a bonus, the mantra always puts my dog right to sleep. 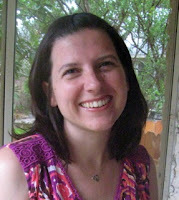 Carie Juettner is a poet, short story author, and novelist in Austin, TX. Her work has been published in Nature Futures, The Texas Observer, and The Texas Poetry Calendar, among other places, and she has a story forthcoming in Ember: A Journal of Luminous Things. In addition to writing, Carie substitute teaches, shelves library books, and speaks to students about poetry. Follow Carie's blog at cariejuettner.com. Carie--Only instrumental. Vivaldi "The Four Seasons" or smooth jazz or simple instrumental guitar (like Marcel Dadi). I like total silence when I am at the computer since I am so easily distracted. I write a good bit late at night and my muse is the moonlight in my window. Right now my heater is kicking in and surprisingly enough, now that I am noticing it, it is comforting! I am going to check out your music list. I need to reclaim some magic. Lovely post! There's a "Classical for Work" station on Pandora that I only listen to when I write. It's entirely instrumental and keeps me company without distracting me (except when something Inrecognize from a Bugs Bunny cartoon comes on!) Tuning in to that station has become part of my pre-writing ritual, and I can feel myself slip into Writer mode when the music starts. I've always preferred silence when I'm actually writing. I can work in a coffee shop or something with equally vague white noise/background sound, but actual music distracts me. That said, like you I've occasionally created playlists for a novel. I don't listen while working, but I absolutely love to go on a long walk or bike ride right before working to get in the mood with my playlists. It's a great way to get in the zone!